Colin Scholl is serving twenty years in California’s R.J. Donovan Correctional Facility (RJD-CF) prison for grand theft. He has contributed poetry and essays to Bad Subjects since 2013. In 2017 he participated in the writing and production of the theatrical work “Visions, Dreams of Imagined Things” by Awaken Dreamers, collective name for the fifteen Donovan’s Yard C Writers. It employed spoken word and onstage slide projections, and was part of the Playwrights Project’s Out of the Yard program on Yard C, with teaching artists Cecelia, Chris and Albert at the RJD-CF, a program sponsored by the California Arts Council, California Department of Corrections and Rehabilitation, and the William James Association. 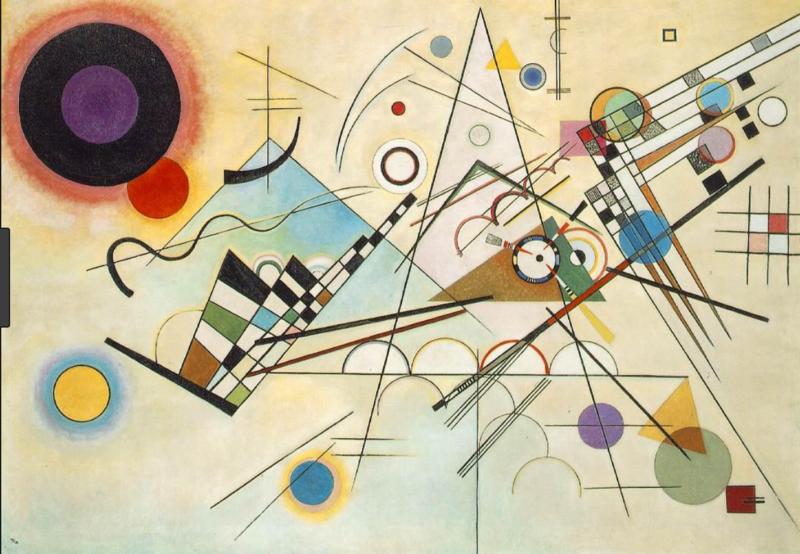 Scholl voiced the part he wrote for Wassily, Wassily Kandinsky’s painting “Composition VIII” in the Gallery of Abstract Art scene, and then voiced Who’s Your Dada? in the scene called Celestial Intervention 2. Hey, Piet, you got a match? We’ve got to burn these Nationalists before they get us. People see me as one [gesturing rounded circular shapes] or the other [sharp triangular shapes] but never as I am [combinations of both, continually moving between shapes]. It makes them angry that I won’t conform, won’t fit into their tidy little boxes. Oh, the questions! Well…they’re better unspoken. The cliché will do fine for most. If you’ll just read between the lines you’ll see I’m neither and both. Some see beyond the surface, and try to riddle it out, but return to the comfortable likes at the sight of uncomfortable truth, and who I am to box them in. For years I’ve tried to remove the mechanism they installed in my head. It gets kind of messy, like cleaning squid, and now I’m homesick for places I’ve never been. You can own what’s yours and be who you truly are. The sky broadcasts something heavier than sky, it’s easy to see but with the double pained glass, I hardly feel it. Intentional or not, the pun “double pained” glass blocks (or amplifies?) feeling, as a double-paned window might block heat. And drama gives these stressed and guarded (!) men opportunity to discharge some pain and anguish. Colin Scholl formerly worked in software development, and pursues Rabbinical studies while serving his sentence. He welcomes correspondence—and Mail Art—sent to Colin Scholl #G39728, RJD-CF, C-11-241, 480 Alta Road, San Diego CA 92179-0001. The Playwrights Project can be reached at 3675 Ruffin Rd. suite 330, San Diego CA 92123.